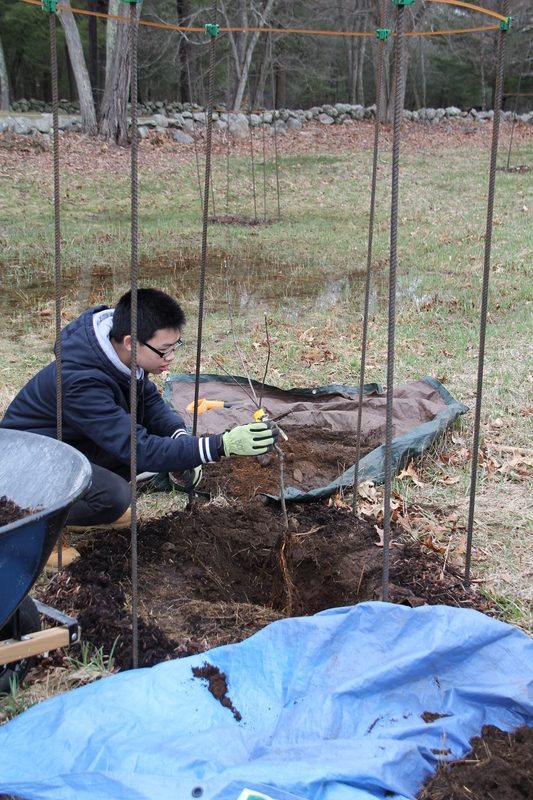 We returned to Minute Man National Historical Park to finish the orchard that we had began back in the fall. We worked with Margie Coffin-Brown who is the resource manager at the park and the GearTicks who is a youth robotics team organization from Lincoln, Massachusetts. 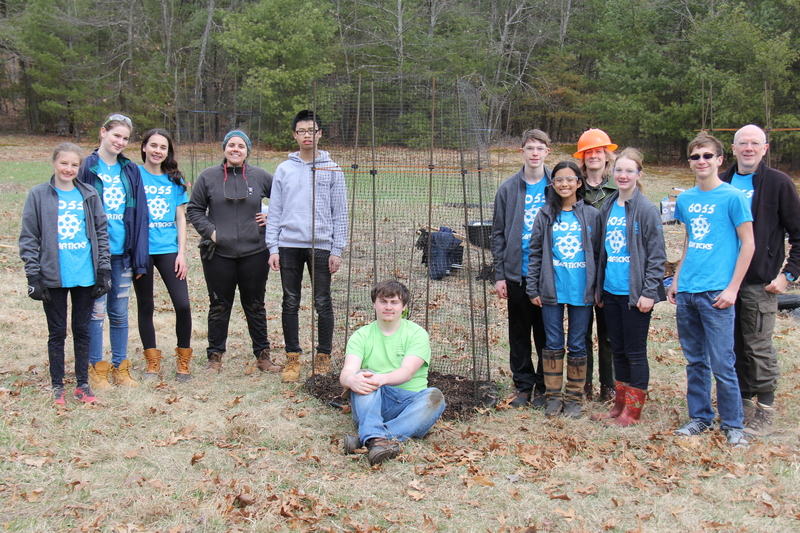 The GearTicks group helped the park to create a fastener that is used at the top of the tree protection cage to help keep the rebar posts together. In the picture below you can see the green fasteners along with a metal band that keep the rebar together to hold up the netting. The park is hoping that this new type of caging will be successful in deterring animals from impacting the growth of the trees (primarily eating at the trees) while they are establishing themselves in the soil. This caging system may be a prototype that the park shares with other parks to implement a similar integrative pest management control system. 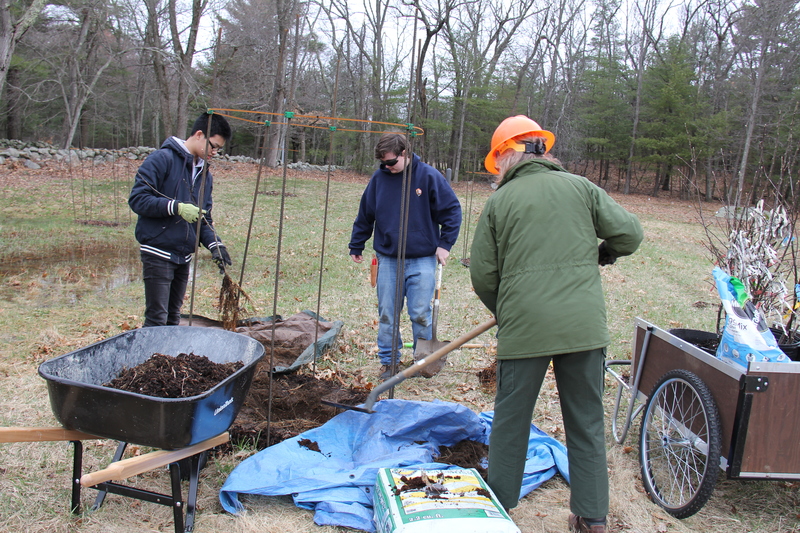 With the help of Margie and the GearTick we were able to plant 15 apple tree saplings in the orchard from four different varieties: Liberty, Baldwin, Roxbury Russet, and Rhode Island Greening. The first couple of trees there was much difficulty in planting the trees, but then the soil became extremely rocky. The rocks range from small pebbles to rocks about the size of a person’s fist. In order for the trees to be planted and have a chance to survive we had to add peat moss and other additives because of the low nutrient quality of the soil. After each tree was planted we installed vole netting around to the tree and into the hole that was dug, to help prevent critters from eating the roots. Then we used 2 folded pieces of construction paper and laid it around the tree to prevent weeds from re-sprouting, and then we placed the mulch on that paper. Next, we installed the hardware cloth around the trunk of the saplings this was to prevent small animal from standing of their hind legs and eating away at the trunk. 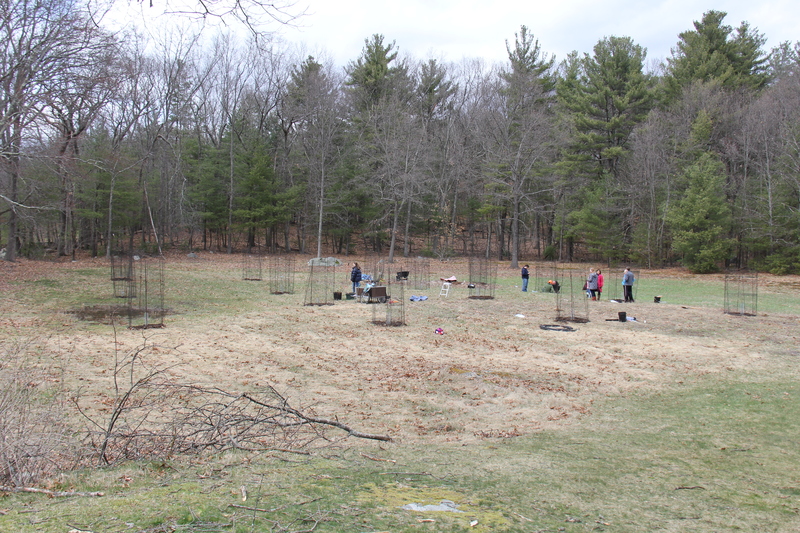 Finally after all of that was installed we surrounded the cage with the deer protection. The deer protection was connected together with large zip ties (Fasteners) just like the hardware cloth was. The Ambassadors and Margie begin the installation of rebar for about three cages at a second location for an orchard at the park. The favorite part of the day for was being able to finish what we began back in the fall, and also being able to help teach a group of the GearTicks how to plant a tree was challenging but also rewarding! We hope that this pest management system will help the park to grow trees in these newly established orchard without various animals eating the plant material. It will be exciting to check back on this project next year to see how the protection system is doing. Thanks to Minute Man National Park staff Margie, Lars, and Lyndon for hosting us! We had a great time! Our group at the end of a productive day!